@ The PROJECT Arts Center, July 3 – 8. Jesus Christ (Son of God and father of the modern stand-up) returns to earth for His long-awaited comeback tour. He doesn’t get past U.S. immigration. He’s a bearded, Middle-Eastern guy, prepared to die as a religious martyr. I have heard of this play, now I must go see it. 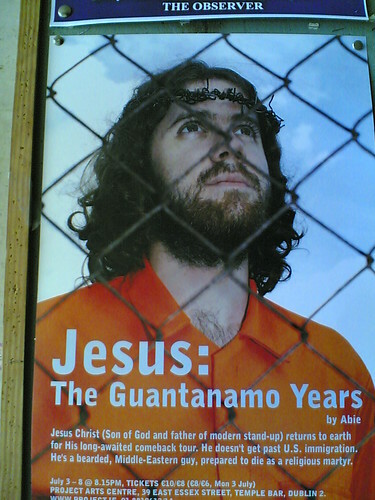 Time for the country of my birth and of my foremothers & forefathers to get out of Guantanamo. by Ms. Jen on Wed June 28, 2006 | Permalink | Uncategorized.